The MTM provides high density 155M to 11.3G testing at layers 1 through 3. Concurrent users can control a broad protocol range including OTN, GigE/10GigE LAN, SONET/SDH, and Fibre Channel. The VIAVI ONT-600 Multiport Test Module (MTM) design provides unparalleled value with support for multiple Layers 1 to 3 protocols at 155 Mbps to 11.3 Gbps rate port rates. These unique benefits reduce CapEx and OpEx because our customers no longer have to purchase, manage, and maintain multiple tests sets to perform these functions. 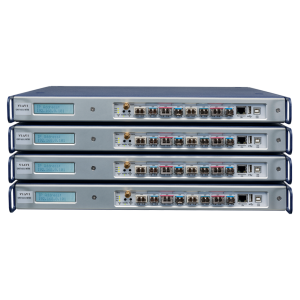 The MTM supports multiport testing with four SFP/SFP+/XFP port banks. Each port bank supports one test, enabling up to four concurrent test sessions. This flexibility enables each user to generate/analyze traffic over a broad range of protocols and line rates.